In order to truly answer questions of hurricane frequency one must move past short-term human-documented meteorological records and find environmental proxies for determining historical hurricanes. Just recently, Miller et al. (2006) established such a proxy when they documented an oxygen isotope record from longleaf pine trees spanning 220 years. This article describes an inquiry-based activity for high school students based on this research. The activity integrates chemistry, biology, and Earth/environmental sciences while engaging students in problem-solving exercises and group collaborations. This is a wonderful marriage of many different scientific disciplines and a great way to show how radioisotopes can be used as climate proxies. 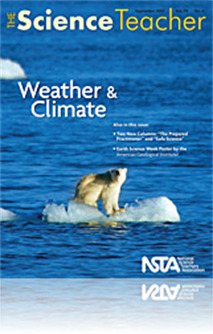 Whether it is used in a chemistry classroom as an example of the use of radioisotopes or in an earth science or environmental science class to show how scientists use proxies to determine historic climate events, this would be a great data analysis exercise.